Callum graduated with honours from UQ in 2017 and kicked off his career at NWPK immediately after. 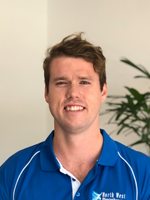 Callum has a special interest in treating sports injuries as well as chronic back and neck conditions. Callum runs our hydrotherapy sessions on Tuesdays and Thursdays and is also available for regular appointments from Monday to Saturday. Outside of work Callum plays rugby for West’s, loves to travel and has recently completed the Kokoda trail and visited Machu Pichu.